automatic, then single wipe (see next page). 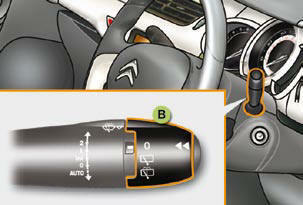 If a signifi cant accumulation of snow or ice is present, or when using a tailgate bicycle carrier, deactivate the automatic rear wiper via the multifunction screen confi guration menu. The function is activated or deactivated via the multifunction screen confi guration menu. Pull the wiper stalk towards you. The windscreen wash, then the windscreen wipers, operate for a specifi ed time.